A Sennebogen 690 HD duty cycle crawler crane is being used as an all purpose crane to assist construction of an underground road system in Singapore. 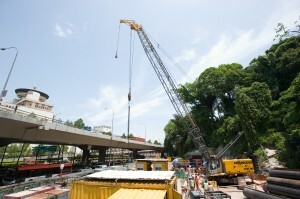 Tuksu Engineering & Construction is employing the crane for the Sentosa Gateway Tunnel project, a two-lane one-way road for outgoing traffic from the island of Sentosa, set for completion by the end of 2015. The 90t Sennebogen 690 HD crane is being used for lifting and loading at the narrow construction site, located adjacent to busy roads.